Aberdeen manager Derek McInnes has criticised the "incompetency" of the Scottish FA appeals process. 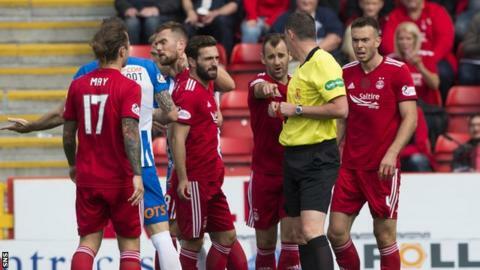 McInnes was angered that the club's appeal against Michael Devlin's red card in the 2-0 home defeat by Kilmarnock was dismissed last week. Nobody from Aberdeen was allowed to attend the hearing which is conducted by trained judicial panel members. "It really angers me, and saddens me, that we can't come to what I feel was the only verdict," McInnes told RedTV. "We have been victims in the last couple of games of referee mistakes, and we accept that. But when there's an appeals process there, you would expect that to get to the right outcome. "In the last four or five appeal processes with different clubs, there just doesn't seem to be that common sense conclusion. That goes right across the board - managers, supporters, journalists, people in the game, everyone is of the same opinion that we are baffled by some of these decisions." The Dons felt they had produced compelling evidence that Devlin had his shirt pulled by Eamonn Brophy before the defender was penalised for pulling down the Killie striker more than 40 yards from goal. Referee Craig Thomson produced a red card for denying an obvious goal scoring opportunity but Aberdeen felt Shay Logan was in a covering position. "I just felt it was an opportunity missed to make the right decision. But that's been pretty standard the last wee while," added McInnes. "And it just means people lose confidence in the whole process, and it will make you think twice about appealing again in the future." If Scottish Professional Football League clubs decide to appeal against a decision, they must prove that an obvious error has been made. They have until 13:00 on the first working day after the match to lodge their intention to appeal, with their case needing to be submitted by 17:00 the next day. The player or any other personnel cannot attend the hearings, which will be a video conference between a tribunal of trained, independent judicial panel members. As of this season, the Scottish FA's compliance officer plays no part in the proceedings.